The Paracas—named after a cemetery on the south coast of Peru where over 400 mummy bundles were discovered in the early 20th century—are celebrated for their large-scale embroidered mantles. These garments are decorated with multi-colored motifs embroidered along the textile’s edges and placed in rows across its surface. Paracas mantles are technologically simple, created with stem-stitched embroidery on a plain weave foundation. However, they were items of great value, typically measuring over 6 feet wide, embroidered using threads of nearly 200 distinct hues, and using exotic camelid wool imported from the highlands. It has been estimated that it would take over 1,000 hours to weave and embroider just one of the more impressive Paracas mantles. This fragment is just one small element that was removed from a larger mantle. As more complete Paracas mantles show, nearly identical motifs were embroidered at regular intervals in evenly spaced rows and columns on the large rectangular field, creating a checkerboard-like pattern. This controlled design was enlivened through the use of different color combinations for different sets of figures and by alternating the direction which each figure turns its face and body. These effects create a variety of diagonal, vertical, and horizontal sequences and rhythmic patterns suggesting movement. The figures embroidered on Paracas mantles include an assortment of anthropomorphic and supernatural beings who often are ornately dressed and hold objects including forehead ornaments, knives, and trophy heads. Some embroidered elements are recognizable natural forms, depicting specific plants and animals, yet it is common that a single element is enhanced with numerous additions and attachments, increasing the complexity of each motif. 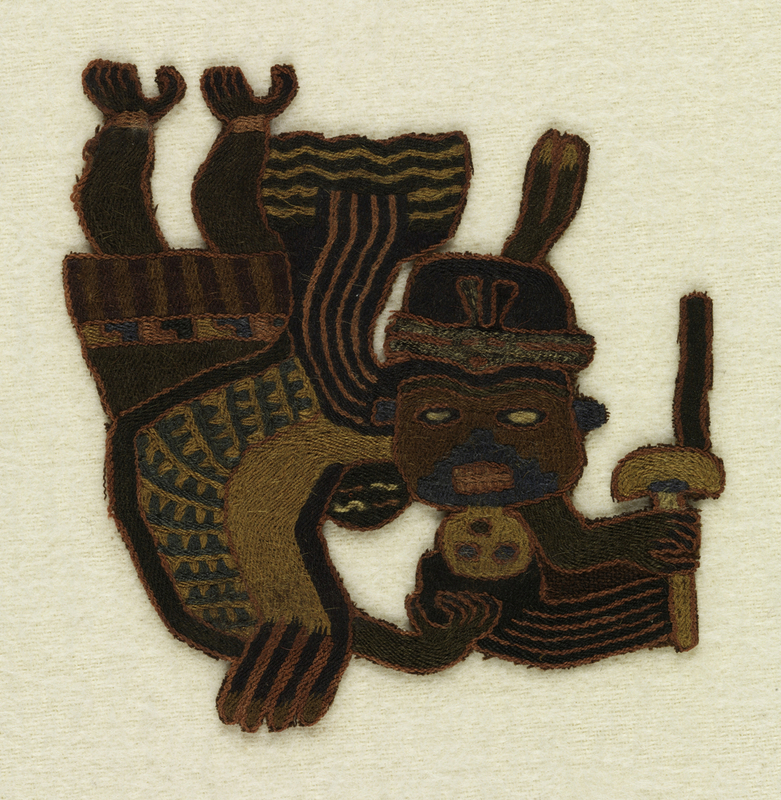 This fragment depicts an anthropomorphic being that is often seen in Paracas art—the figure stands on clawed feet, yet its body arches backwards so strenuously that the individual’s head appears up side down, with face turned frontally. While common, the significance of this pose is unclear, possibly related to dancing, flying, falling, or a shamanic-like transformation. This figure wears a tunic with an embroidered trim and tabbed fringe, and has a forehead ornament that recalls the face and whiskers of a feline. Wrapping around the torso like a cape is a patterned wing and the banded tail feathers of a bird, suggesting the conflation of human and avian. In one hand, the figure holds a fan-like object and staff, in the other he grasps the flowing hair of a decapitated head, holding it to its prominent mouth as if to consume its sacred powers. The ultimate meaning conveyed by these embroideries is not well understood, although they likely reveal the beliefs and practices of the ancient Paracas. Some embroidered mantles show wear, indicating that they were used as garments; therefore, the motifs may have held particular significance to the individual within the community. However, most of the Paracas textiles discovered archaeologically were incorporated into layered mummy bundles, indicating that their significance was multi-faceted and likely changed over time and context. Elizabeth Irene Pope, Ph.D., is the Collections Manager and Research Assistant in the Arts of Africa and the Americas at the Art Institute of Chicago. Isaac Facio is Assistant Conservator of Textiles at the Art Institute of Chicago and is a weaver specializing in 3-dimensional woven structures. Thanks for including the Boston link so readers can see the full beauty/amazement of an entire mantle. It is spectacular.